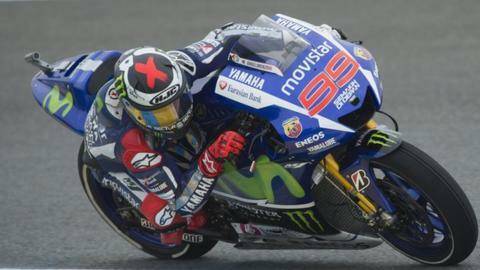 Jorge Lorenzo held off the challenge of his Movistar Yahama team-mate Valentino Rossi to win the French MotoGP. The Spaniard, 28, rode an almost flawless race to secure his second consecutive victory, with Rossi second and Ducati's fellow Italian Andrea Dovizioso third in Le Mans. Britain's Bradley Smith finished in sixth place on his Monster Yamaha. His compatriot Cal Crutchlow crashed out after eight laps when he lost control of his CWM Honda on turn six. "I made a mistake - my foot fell off the foot peg when I tried to go for the rear brake and it jolted the bike," he said. Britain's Scott Redding, who won the Moto2 at the French circuit in 2013, retired three laps earlier after crashing his Marc VDS Honda. Repsol Honda's Spanish rider Dani Pedrosa crashed out on the second lap of his return following arm surgery. Lorenzo earned his 35th win in the top category after completing the 28-lap race at the Bugatti circuit in 43 minutes 44.143 seconds. He moves up to second in the overall championship standings, 15 points behind leader Rossi, who has taken 102 points from the five races of the season so far. Lorenzo took the lead on the first lap, moving outside Dovizioso on the first corner after a poor start from Repsol's Marc Marquez on pole. "I had a very good start. I was able overtake Dovizioso on the first corner on the outside to stay in the lead," Lorenzo said. "I then saw Valentino in second place - he really was very quick so I had to push at the maximum knowing that the front tyre was close." Two-time defending champion Marquez fell further behind Rossi in the title race as the Spaniard eventually finished fourth. Earlier, Briton Danny Kent was unable to complete a fourth consecutive Moto3 race win, finishing in fourth place behind an all-Italian podium of Romano Fenati, Enea Bastianini and Francesco Bagnaia at Le Mans. Britain's Sam Lowes finished in fourth position in the Moto2 race, which was won by Swiss rider Thomas Luthi. The next leg of the 18-race Moto GP championship takes place at the Mugello circuit in Italy on 31 May.